After playing some more of this format, I can say it’s definitely better than triple-Ixalan, but certainly nothing special. I did three more drafts this week, and those may be my last, since Legacy Cube returns on Wednesday. There aren’t many formats that could convince me to draft them over Cube of any kind. I would have liked to get deeper into this format, but missing the first few weeks, combined with the early return of Cube means I’ll probably be bidding it goodbye. The week didn’t start off very well for me. In my first draft, I opened a pack where Crested Herdcaller was the clear first pick. Pick 2, I was passed Raging Regisaur, another clear best card in the pack. I got a 6th-pick Hunt the Weak, along with some mediocre cards for the dinosaur deck. It definitely felt like RG was open. Pack 2, Pick 1 was a pretty miserable selection. I took Path of Discovery over Goblin Trailblazer and Jungleborn Pioneer, figuring that it had a higher upside. In hindsight, I wish I had just taken the Trailblazer. Pick 2 was similarly awful, as I had to second pick a Knight of the Stampede over nothing else playable. Green was still open, as my third and fourth picks were Thrashing Brontodon and Hunt the Weak, and I even snagged a seventh-pick Reckless Rage. Pack 3, Pick 1, I was right back in the Pit of Misery, as I had to take Fathom Fleet Firebrand. Certainly a good card, but not one I wanted to first pick. 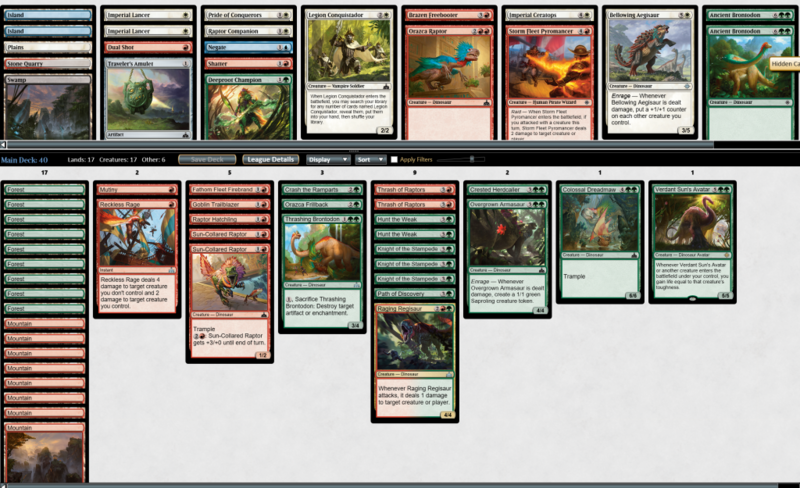 I followed up with Raptor Hatchling and Verdant Sun’s Avatar, and a fifth-pick Thrash of Raptors. I also wheeled a Thrash of Raptors 11th pick. Nope. It’s not like I really had a choice in playing them, since you can’t just play three 2-drops in this format. But I had some hope, at least, that they might do something. The only things they did in any of my matches were chump block and look embarrassing. This wasn’t a very good Path of Discovery deck. It probably should have just been Storm Fleet Pyromancer, which got sided in a lot against flying pirates, or a maindecked Dual Shot. There were just too many 4s in the deck. Round 1, I ran into Champion of Dusk, which is an absurd card, especially when paired with Legion Conquistadors and Forerunner of the Legion. I was put into a Catch-22 where I either had to trade cards like Thrashing Brontadon and Knight of the Stampede for a single Conquistador each or let my opponent draw infinite cards. But even if I do trade, now I’m down several creatures, and my opponent still draws 3 off Champion. Though I finished 1-2, I felt like I could have won the final match if I had ever drawn a Hunt the Weak in any of my three games. I died to flyers that I couldn’t quite race, and killing a single one would have swung the games in my favor. I wasn’t super high on Golden Guardian after last week, but I opened a pack with nothing else that was overwhelmingly exciting. Baffling End, Skymarcher Aspirant, and Exultant Skymarcher, and Moment of Triumph were all very solid white cards, but I wouldn’t be super happy first-picking any of them. I took Golden Guardian because it was colorless and would let me defer on color choice. Plus, maybe I could build around it better this time. I picked up Moment of Craving, followed by an interesting rare in Captain’s Hook. Not the kind of card that you’d think would go in the Golden Guardian deck, which is inclined toward blocking, but it has the potential to turn every one of your creatures into a 2-for-1. And it even helps your blockers trade up, if that’s what you need to do. The equip cost of 1 is great. I’m not sure how this made it to third, as it’s something I would he happy to slam first-pick. I followed up with a fourth-pick Impale, but then playables dried up very quickly. I took a Jungle Creeper and some mediocre white cards. I did manage to pick up a Traveler’s Amulet and a 12th-pick Evolving Wilds (come on, people, respect the fixing!). I think I made a mistake in my second pack, pick 1. I took Slaughter the Strong over Recover and Waterknot, both of which were probably better picks. I saw the late white cards as a signal, but I don’t think they were, in hindsight. They were all mediocre, and I perhaps should have just taken Recover, as I was much more committed to black. Waterknot would have been a higher-risk pick, but defensible because Recover might wheel. Deadeye Brawler was my second pick, and I settled into blue-black. 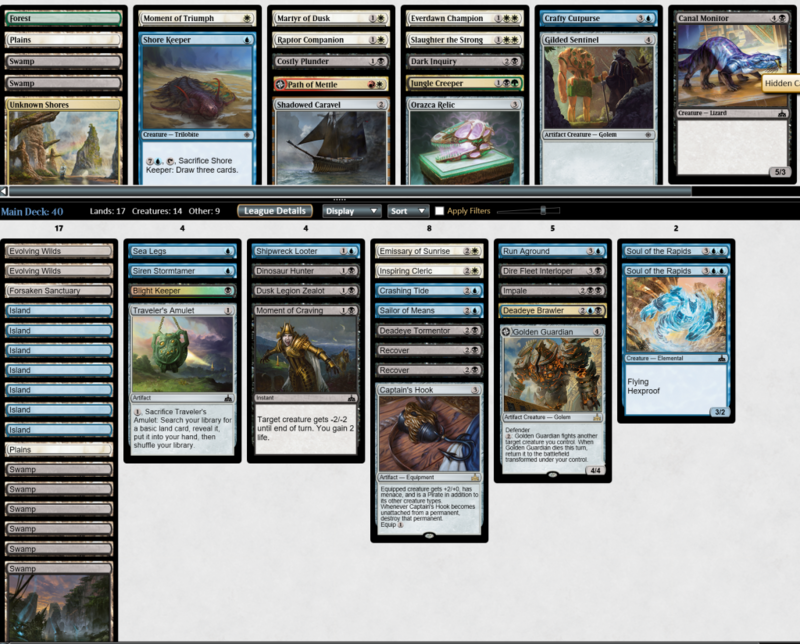 The final deck was very weird, splashing two good, but not really worth splashing, white creatures. I had tons of fixing and two copies of Recover, which made them worthwhile. Ixalan was hot garbage, as usual. I picked up some cheap flying idiots, and that was it. In round 2, I played one of the most interesting games of limited I’ve played in a while. My opponent also had Golden Guardian, and we got into a dance around trying to kill our own Guardians. My opponent had cast a Hunt the Weak on his Spire Winder, and they eventually ascended to make the Winder a 4/5. They only left up 2 mana, and tried to fight their Winder (which was their only other creature) on my end step. I hit the Winder with Swords to Plowshares Sea Legs, meaning they were unable to flip the Guardian that turn, while I finally flipped mine thanks to Captain’s Hook on a Shipwreck Looter. They untapped and had the choice to flip their Guardian, but I was at about 10 life, meaning that the Spire Winder was maybe their best way to kill me. Because of Sea Legs making it a 2/5, they would have had to double-fight with the Guardian in order to make sure it died, which would cost them the Winder. Ultimately they declined to fight the Winder, and I was able to menace my way through everything else until they were forced to block with the Winder. They eventually flipped their Guardian, but I was too far ahead with no clock on me. I don’t honestly remember what I lost to in the finals, and MTGO seems to have deleted all of my match history and recordings with the new patch last Wednesday. Everything went right with this draft. I had my pick of every single Merfolk that came my way, rounding out with cheap things like Siren Reaver and efficient removal. I’m not certain which final build was correct, but the deck felt completely unfair in the first two matches. I won both 2-0, and my opponents were never in any of the games. Of note, I took the foil Jadelight Ranger over Ghalta, Primal Hunger in pack 1 because MTGGoldfish told me that foil Jadelight was 8.5 tix, but no bots are buying them for more than 3. Had I known that, I probably would have taken Ghalta there. In round 3, I ran into the mirror, except my opponent had Deeproot Elite on turn 2 both of our first games. I managed to squeak out game 1, but got crushed game 2. Game 3, my opponent didn’t have the Elite, but started out with Mist-Cloaked Herald and River Sneak, following up with Jade Bearers and a Jade Guardian to put me low. I kept a hand with 3 Islands, a Mist-Cloaked Herald, and three Shaper Apprentices. A gamble, yes, but I had five draw steps to hit green mana. On the final turn of the game, my opponent was tapped out, at 9 life, and I had all three Apprentices in play. 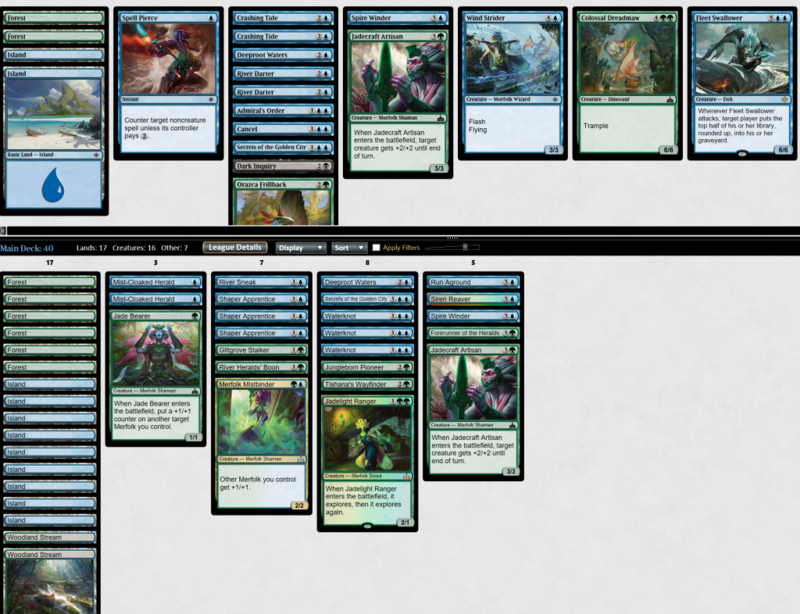 I was holding Merfolk Mistbinder to steal the game if I found a Forest, but alas, it was not to be. One question I have is whether it was even correct to play Jadelight Ranger. It’s a great, efficient card, but my deck was so heavily slanted toward blue that I rarely had GG. I only cast the Ranger once. I drew it a few other times, but never had the mana to cast it, not that I needed to when I was tempoing them out with my blue cards. I could have played one more Forest, perhaps, but I felt like I really needed the 11 blue sources with four UU cards at 3 mana. I ran a 1/1 split on Jadecraft Artisan and Spire Winder because I wasn’t sure which was better for the deck. Spire Winder was the much better performer, and I often wished that I had run the second instead of the Artisan. +2/+2 on an unblockable dork is nice, but repeatable flying beatdowns were almost always better. I’ll end the format on a decent record, though obviously this is a fairly small sample size. If cube wasn’t coming back next week, I’d certainly play more of this format, but it just has too much of Ixalan left in it to be a truly good format. RIX improved significantly upon XLN, but XLN was just too bad for RIX to elevate the format like Hour of Devastation did with Amonkhet. As for rares, I got to re-evaluate Golden Guardian in the context of a better deck for it. It certainly performed much better in a grindier deck. Captain’s Hook was a stone-cold bomb every time I played it. Verdant Sun’s Avatar is a much better card in this slower format. Jadelight Ranger is a card that is obviously good but didn’t get to shine in my mostly-blue tempo deck. Theros was a fun format for a few drafts, though it quickly gets stale losing to one big creature that you just can’t remove (Hmm…sounds like another format I know…). My favorite decks to draft were the ones that tried to go around those big dumb creatures. Wavecrash Triton was my most drafted card on MTGO when Theros was around. With that in mind, I started off on Griptide, Nimbus Naiad, and Lightning Strike. Blue dried up after that. 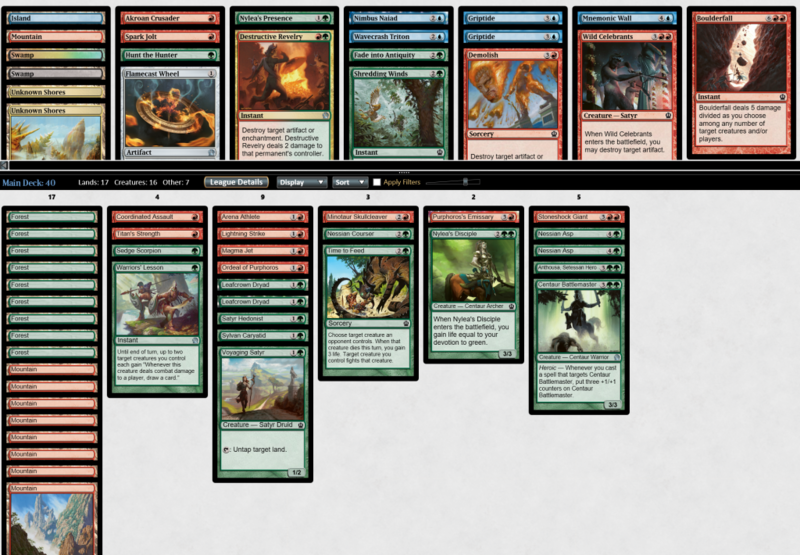 Fortunately, the people in my pod forgot how busted big snakes are in this format. Nessian Asp is a hell of a card, but so are Anthousa, Setessan Hero and Centaur Battlemaster. I ran into the nuts monoblack devotion deck full of Gray Merchant of Asphodel in round 1, but bounced back to murder opponents with broken 5-drops in rounds 2 and 3. The highlight of the draft was dealing 16 damage to my opponent through two blockers, starting with just a 3/3 Battlemaster. Time to Feedate one blocker (6/6). Ordeal of Purphoros killed another (10/10). Titan’s Strength finished things off for a total of 16/14.